If you use the free BandLab social music service, Cakewalk lets you easily mix down and export the current project directly to BandLab. In the Control Bar’s Export module, select either Project or Selection to specify if you want to publish the entire project, or only selected clips and tracks. If you want to publish individual tracks or buses, and the project contains more than 12 tracks or buses, you must select Selection and manually select the tracks or buses you want to export. 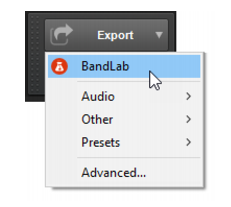 Click the Export button, then select BandLab to open the Publish to BandLab dialog box. Project Name. Specify the name of the project as you want it to appear in BandLab. By default, the name is inherited from the Cakewalk project name. Note: After the first export, subsequent exports from the same Cakewalk project will appear as revisions of the original BandLab project. Mix. Publish the entire mix as a single track. Tracks. Publish individual tracks, up to a maximum of 12 tracks. If the project contains more than 12 tracks, you must select Selection in the Export module and manually select the tracks you want to export. Buses. Publish bus outputs, up to a maximum of 12 buses. If the project contains more than 12 buses, you must select Selection in the Export module and manually select the buses you want to export, along with the audio tracks that feed the buses. For details, see Bus selection and Select tracks/buses that are assigned to a specific bus. The project is exported to the C:\Users\<user name>\Documents\BandLab\Uploads folder. BandLab Assistant (see BandLab Assistant) detects any new or updated folder and files, and automatically uploads them to your BandLab library. Note: Uploaded projects are private by default, and not publicly shared. 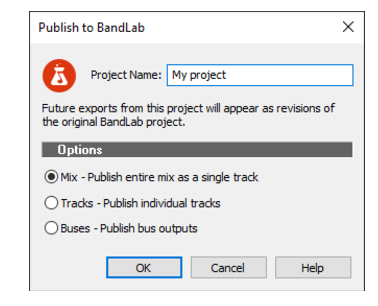 You must explicitly publish or share the project if desired from your BandLab library. Note: Projects will export as either 16-bit / 44.1kHz or 16-bit / 48kHz WAV files, depending on the project’s settings. Higher settings will automatically downsample to the required format during export.